Clean and wash chicken. To it add lemon juice, 2 tea spoons ginger garlic paste, 2 tea spoons red chilly powder, haldi and a tea spoon of dhaniya powder. Mix well and leave it aside for 15 to 20 mins. Grind 2 table spoons of grated coconut, kaju, dhaniya (whole). jeera and khas khas to fine paste. Heat 3 table spoons of oil in a pan. Add bay leaves, cloves and cinnamon sticks. When cloves starts spluttering add finely chopped onions, green chillies and fry until they turn pink. 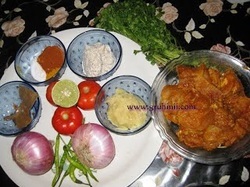 Add 1 tea spoon of ginger garlic paste, cook for few sec and add the marinated chicken to it. Stir well add salt to it. Close the lid and cook in a medium flame for about 5 to 6 mins. Now add the coconut kaju paste to it and stir well. Add finely chopped tomatoes to it. Add little water (1 cup) of water close the lid and cook for 10 to 12 mins. until the chicken is done.